Early bloomer Very tiny cross-shaped 4-petaled flowers. 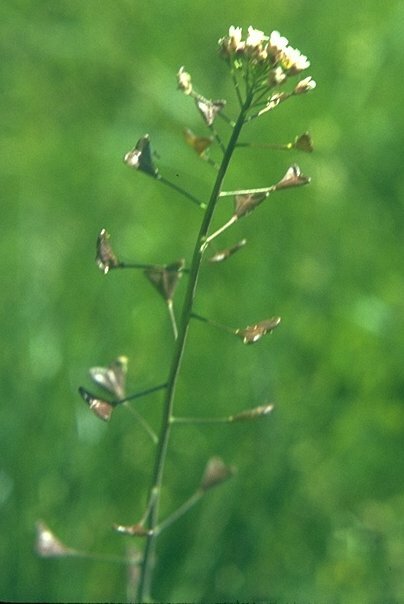 Heart-shaped seedpods resemble a shepherd’s purse. Notes: It is said to resemble the purse early shepherds carried at their belt. It is related to another low-growing species found on our trail, usually in proximity to the Shepherd’s Purse, called Pepper Grass (Lepidium nitidum). Lepidium means little scale. As with many in this genus, they are noticed more for their seedpods than their very tiny flowers. The tiny spoon-like seedpods are shiny, oval-green at first, then reddish purple with age. Used as a potherb, it tastes like cabbage. The pods have a peppery taste. Indians parched the seeds with hot rocks in a basket, ground them up and made them into mush. It is said you can infuse 1 oz of leaves in 12 quarts of water as remedy for bruises or to stop internal bleeding. Young mustard leaves can be cooked or eaten raw—seeds are toxic to livestock but are eaten by doves, finches, larks, rabbits, squirrels, deer and white butterflies.